The material developed by Anthamatten and graduate student Yuan Meng is a type of shape-memory polymer, which can be programmed to retain a temporary shape until it is triggered—typically by heat—to return to its original shape. The findings are being published this week in the Journal of Polymer Science Part B: Polymer Physics. The key to developing the new polymer was figuring out how to control crystallization that occurs when the material is cooled or stretched. As the material is deformed, polymer chains are locally stretched, and small segments of the polymer align in the same direction in small areas—or domains—called crystallites, which fix the material into a temporarily deformed shape. As the number of crystallites grows, the polymer shape becomes more and more stable, making it increasingly difficult for the material to revert back to its initial—or “permanent”—shape. The ability to tune the trigger temperature was achieved by including molecular linkers to connect the individual polymer strands. Anthamatten’s group discovered that linkers inhibit—but don’t stop—crystallization when the material is stretched. By altering the number and types of linkers used, as well as how they’re distributed throughout the polymer network, the Rochester researchers were able to adjust the material’s stability and precisely set the melting point at which the shape change is triggered. Heating the new polymer to temperatures near 35 °C, just below the body temperature causes the crystallites to break apart and the material to revert to its permanent shape. Having a polymer with a precisely tunable trigger temperature was only one objective. Of equal importance, Anthamatten and his team wanted the material to be able to deliver a great deal of mechanical work as the shape transforms back to its permanent shape. Consequently, they set out to optimize their polymer networks to store as much elastic energy as possible. Anthamatten’s shape-memory polymer is capable of lifting an object one-thousand times its weight. For example, a polymer the size of a shoelace—which weighs about a gram—could lift a liter of soda. 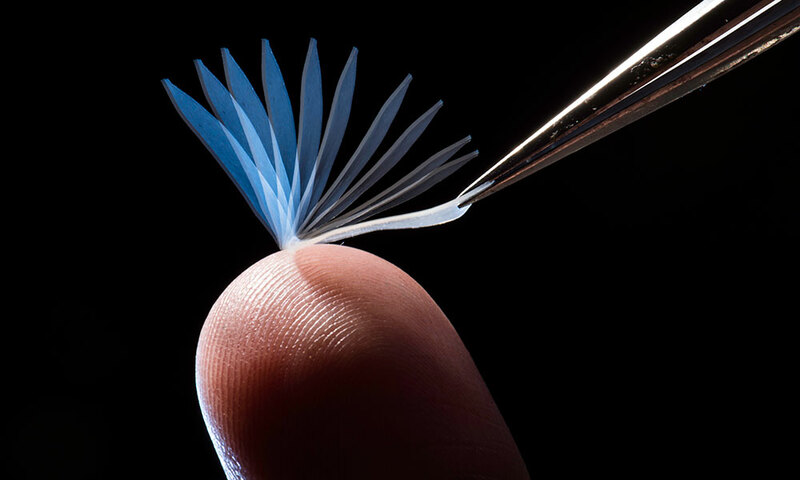 Anthamatten says the shape-memory polymer could have a variety of applications, including sutures, artificial skin, body-heat assisted medical dispensers, and self-fitting apparel.